For their lovely summer wedding at Botleys Mansion, Sarah and Duncan, married July 2015, embarked on a colourful adventure of ivory, pinks, lilac and blues when it came to planning their wedding flowers. The pretty colour palette we used for their wedding blooms could not have been more fitting on that gorgeous sunny day. For Sarah’s and her bridesmaids which wore beautiful purpley blue full length dresses, we created stunning bouquets of roses, paeonies, Mimi Eden spray roses, muscari and lisianthus, in beautiful hues of ivory, pinks, lilac and blue. The men wore classic buttonholes of ivory Avalanche roses with blue muscari, and the mums wore dainty wrist corsages in pretty pastel colours. 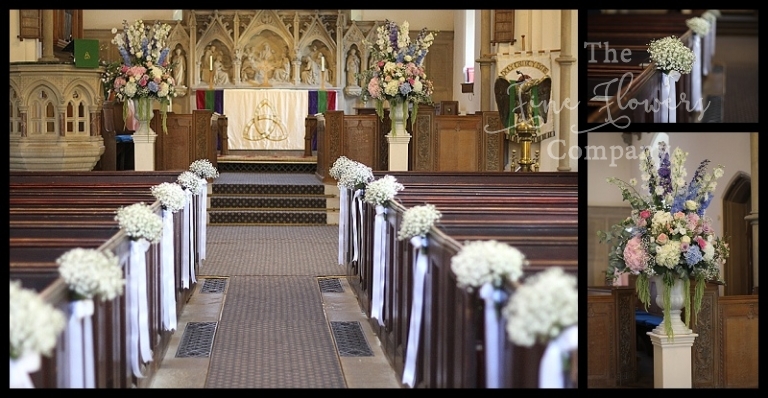 The beautiful Holy Trinity Church in Lyne was dressed with 2 amazing urn centrepieces to frame the ceremony, while guests were welcome to the church by pretty lytch gate flowers, bay trees adorned with roses framing the church entrance, and pretty gypsophila pew end posies lining the aisle. Following on, Sarah & Duncan arrived in style, in a beautiful Bentley, for their summer wedding at Botleys Mansion. The guests were welcome by a focal urn centrepiece on the entrance table, and the light and airy atrium was dressed with tall guest table vase centrepieces full of happy summer blooms. For this summer wedding at Botleys, we used a pretty mix of roses, paeonies, hydrangeas, lisianthus, larkspur and delphiniums, in beautiful shades of ivory, lilac, summery pinks and purpley blues, all accented with subtle silvery green eucalyptus foliage. My favourite piece was the unusual guest seating plan I created for Sarah & Duncan – I used a vintage step ladder and created pretty posies of summer flowers to which Sarah and Duncan’s guest name cards were added. Each table name was the word love in different languages. Who says romance is dead? Some of the lovely photography from this very happy wedding was thanks to my own amateur efforts, while the better shots are with thanks to Sarah and Duncan courtesy of Neale James Photography.